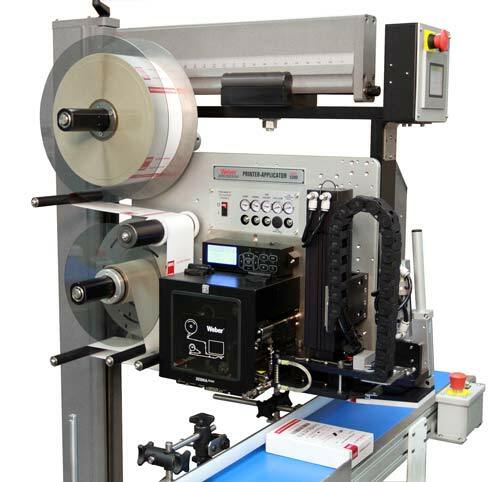 Weber's Model 5300 print-apply system is redefining the meaning of versatility in heavy-duty, 24/7 pressure-sensitive label printing & application. 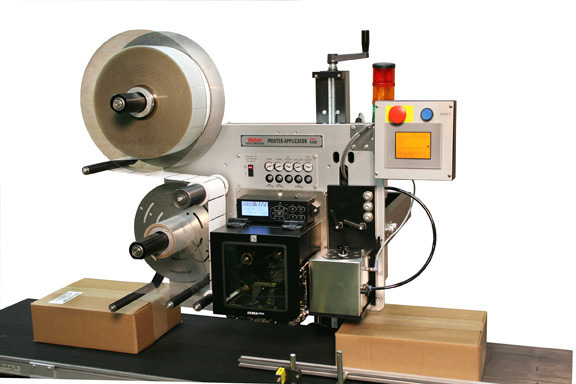 A wide range of application methods make the 5300 the go-to label printer applicator for just about any application. The 5300 tamp-blow print-apply system is a very popular method of air-assisted label placement used with standard applications, and is particularly useful in the labeling of recessed areas on products. The 5300 tamp-blow can label top, sides, front or back of containers. Prints and applies two labels to the front and side of a product; or its side and back; or one label can be placed on the front, side or back of an item using tamp-blow technology. This non-contact method of label application uses air to blow the label onto the product from a fixed distance without the aid of a pneumatic cylinder. 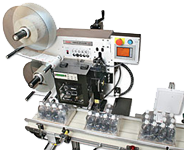 Labels are applied to the front or back of a product using a 90-degree swing arm applicator that reaches over the conveyor and tamp-blow technology. 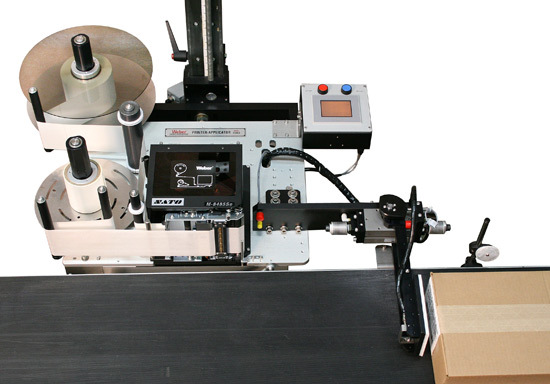 Prints and applies a label around the corner of a box or product using tamp-blow technology. Creates a tamper-evident closure on medical device boxes. One label is wrapped around the corner of a case using an articulating, contact method of application. Helps with dual-panel labeling rwquirements on cartons. When you need to label pallets at a distance, this system uses an extended tamp cylinder to label one side of a pallet as it passes. Sometimes your pallets need to have labels on adjacent sides for identification. This method uses a swing arm for the printing and application of adjacent sides of pallets in line. 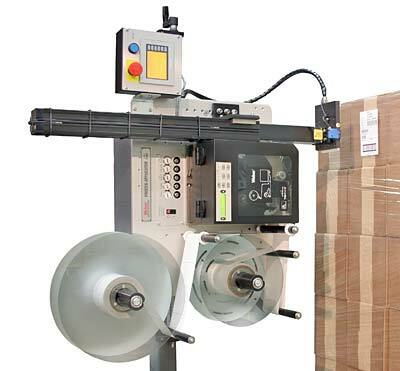 This print-apply system uses a swing arm to reach around the front or back of a passing pallet and apply a label. 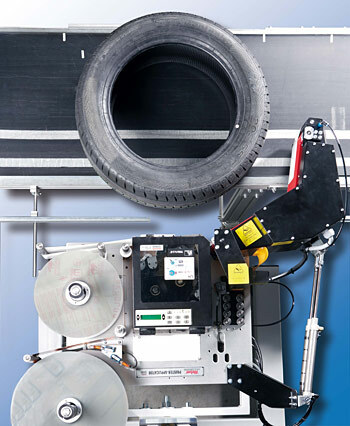 This system accurately and securley prints and applys labels to the outer diameter of passing tires on a conveyor. Perfect for required tire industry labels. Prints, encodes, verifies and applies RFID smart labels to cartons and pallet loads in one automatic operation. Automatic label rejection if label doesn't scan correctly. 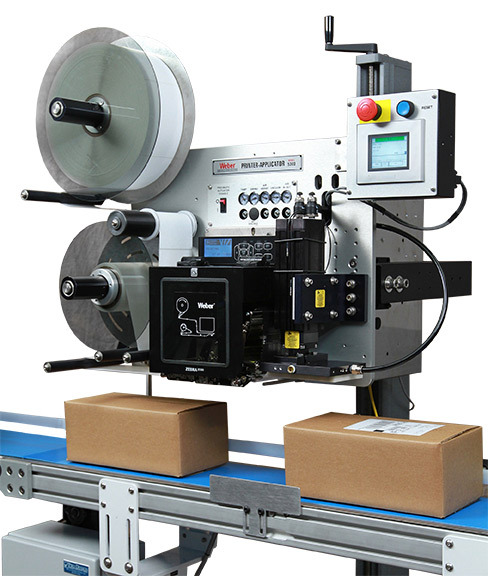 Effective June 30, 2019, Weber is announcing the manufacture, service and support discontinuation designated as End of Life (EOL) and End of Service (EOS) for the Model 5100 and the Model 5200 label printer applicators. No further support will be provided once the End of Service timeline is reached. Weber will maintain spares and support capability throughout the life of all contracts currently in place. It is strongly suggested that customers look at migrating to one of our current printer applicator solutions.